1. Shanti's Mailbox crew have gathered from source that Gargamel Music has received multiple concert offers from different event management houses following the official announcement of Buju Banton's not-too-far release from prison. After his release, Buju Banton will get really too busy touring the world to play for his heavily starved fans. The reggae-dancehall champion has already been booked even by many promoters while in prison and his team at Gargamel Music is still finalizing new concert proposals from across the world. Shanti's Mailbox will bring you Buju's tour dates and itinerary when all else is finalized we we have the Gargamel approval to publicise Buju's updates. 2. After Macka B's "Road Rage" single receives massive airplay in Australia, and it create a high demand for the singer's presence in the country, Macka finally lands a big concert deal in Australia. Macka B's "Health and Wealth" tour was slated for tomorrow Friday 16 March. The concert will be staged at Max Watt's. Macka will be backed by the Roots Ragga Band. 3. Let's sneak into Damian Marley's tour folder quickly to pick out his itinerary updates. He has bagged multiple tour deals after his repeat win at the Grammy's this year. On Damian's Europe tour sheet, here goes his itinerary: He will play at Venoy Park on 17th March. Then on 28th June at Manchester 02 Ritz. Next on 29th June at Leeds 02 Academy. Then on 30th June at Birmingham O2 Academy. Also on 1st July London 02 Academy. Outside UK, Damian will play on Monday 2nd April at Sebastapol Hop Monk Tavern, California. 4. In November 2014, the Jamaican journalist and biographer, Totto Helix documented over 300 active reggae-dancehall sound systems in Japan and even wondered greatly at the higher shocking degree of influence reggae and dancehall have had on the Asian continent. Today, the the Asian continent has increased its fascination for the duo genre that it can be considered as a fast cash spot for reggae-dancehall artistes. Shanti's Mailbox is therefore urging all reggae-dancehall artistes and stakeholders to make the Asian continent a priority to rake in big revenues like how Europe's strong fascination for reggae and dancehall has been capitalised upon by artistes like Chronixx, UB40, The Marley's, Protoje, Kabaka, Skara Mucci, etc. 5. Recently, news reached our Mailbox that African reggae and dancehall artistes don't make it to the international apex and questions were asked as to what causes that. 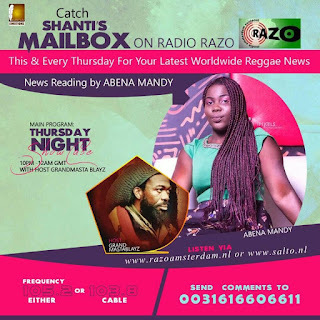 Shanti's Mailbox is making it clear that the African artistes are equally good but the cause for their inability to crack the globe centers around weak promotional strategies and how the world has for a mighty long time relied too much on Jamaican artistes. Should talent hunters look to Africa to invest in developing artistes, the continent's reggae and dancehall will come up close to the level Jamaicans have raised theirs.